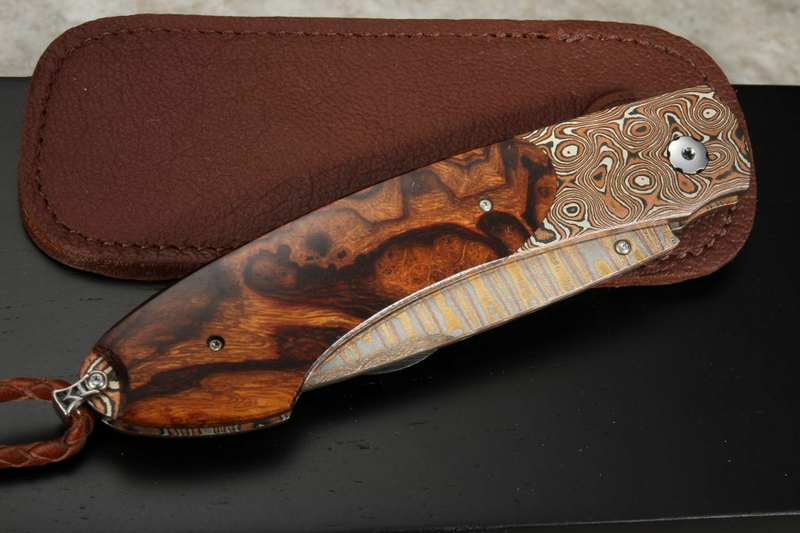 KnifeArt sells the William Henry B12 Anasazi Spearpoint Damascus & Ironwood Knife which features a blade design of gorgeous 'Copper Wave' pattern damascus steel. 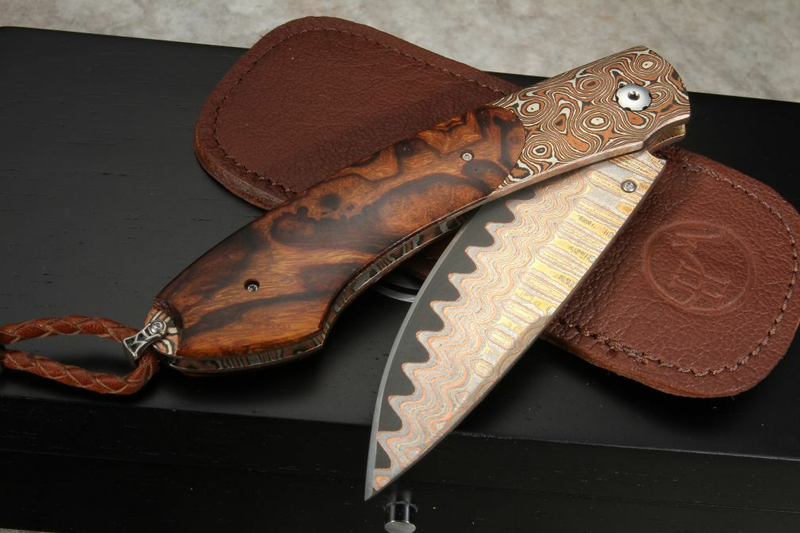 The B12 Anasazi is a limited edition of 100 individually number knives. 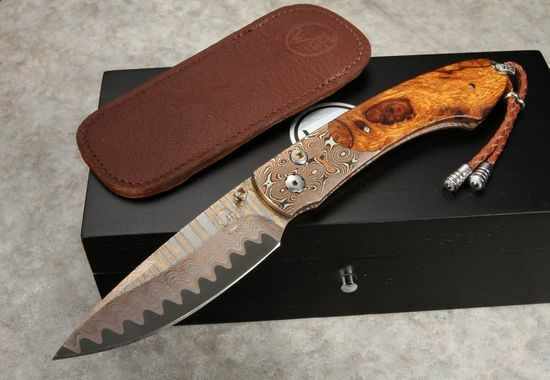 A celebrated maker of high-end knives, William Henry was founded in 1997 by Matt Connable. Each William Henry knife is entirely unique. Every piece is designed and created exclusively in small, limited editions. This lightweight knife weighs less than 2.7 ounces and its Damascus blade is 3 inches long. 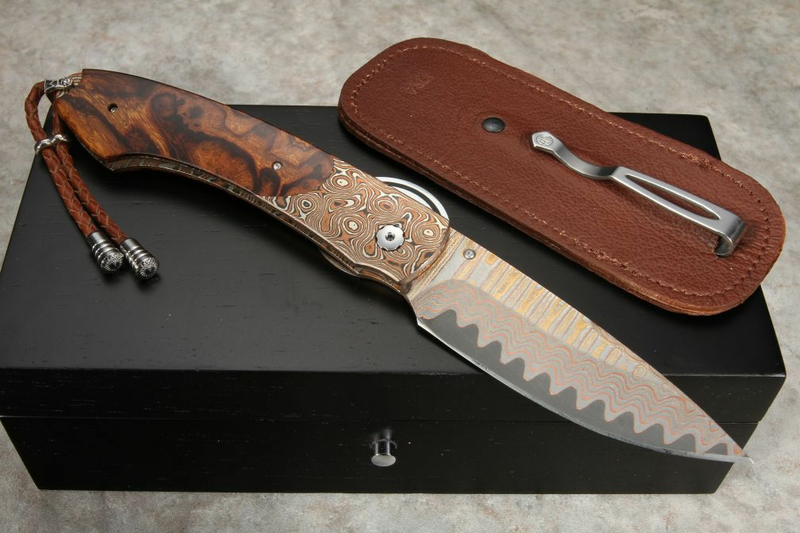 Hand forged Copper Wave damascus with VG-5 cutting core that gives the B12 Anasazi knife a real air of distinction. 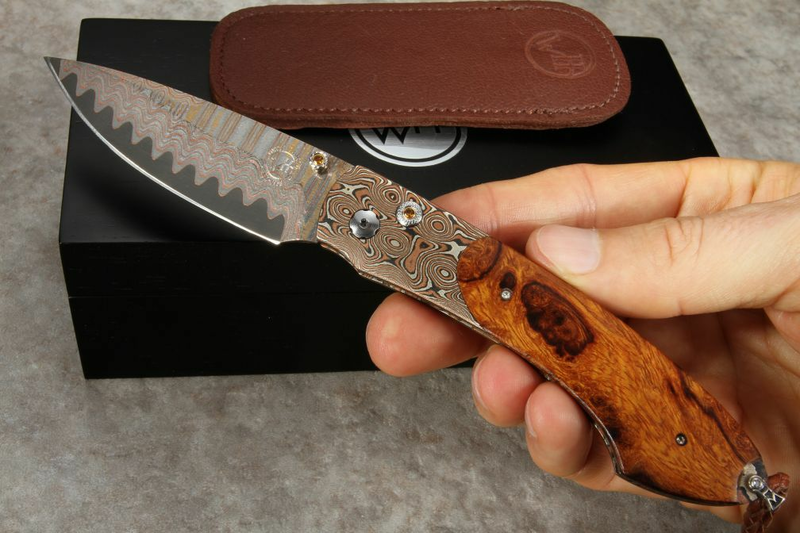 It's such a fine looking and rare knife with integral mokume gane liners that you might want to just keep it in the box for display. But it's also such a rugged performer that the temptation to unleash it in action will always be in the back of the user's mind. The perfect size for everyday carry, the William Henry B12 Anasazi Spearpoint Damascus & Desert Ironwood Knife boasts a premium desert ironwood handle and a button lock mechanism for opening and closing that operates smoothly and reliably. The thumb stud and button lock have citrine inlays. The overall size of the knife when opened is 7 inches long. The B12 Anasazi comes with a leather carrying pouch that has a pocket clip attached. Silver lanyard bale has a braided leather lanyard attached. Free shipping from KnifeArt is available on this rare collectible B12 spearpoint knife, and orders that are received during the business week are almost always fulfilled within 24 hours. Customer satisfaction is always guaranteed.